a new work of short fiction in an Anglican parish publication and credited to Evelyn Whitaker. I've long suspected that she first published in religious press. I also have hints of a couple of other similar publications to chase. the repository of records for Roberts Brothers (Boston) who were the authorized publishers of Evelyn Whitaker's works in the USA. Catalog information notes re. endorsed royalty checks indicate a variant spelling "Whittaker" which may facilitate biographical research. A trip to Boston is in my future. I've done a major review of the medical literature re. myasthenia gravis for a private client. Ward, Mary Augusta (Mrs. Humphry): Robert Elsmere. 1888. Kindle. Project Gutenberg. The best known of Ward's novels is this story of a young Anglican minister married to an orthodox wife with a "spiritual" sensibility. His reason/intellect leads to doubt and he resigns his pulpit. He struggles (they struggle) as he seeks a new path to faith and ministry through a historical Christ. This book is an excellent presentation of the religious and philosophical discussions which grew out of the higher criticism (the biblical textual criticism) of the late 19th Century. Ward, through Elsmere, attempts to answer both traditional faith and "positivism" e.g. the philosphy of August Comte. Fiction is my favorite way to read philosophy and theology and this book was interesting, engaging, informative, and a wonderful love story. "Where and when and how you will, but somewhen and somehow, God created the heavens and the earth!" "The decisive events in the world take place in the intellect. It is the mission of books that they help one remember it." "It is the education of God! Do not imagine it will put you farther from Him! He is in criticism, in science, in doubt, so long as the doubt is a pure and honest doubt... He is in all life, in all thought." "All things change,--creeds and philosophies and outward systems,--but God remains." Ward, Mary Augusta (Mrs. Humphry): The Mating of Lydia. 1913. Kindle. Project Gutenberg. Is friendship without romantic love possible between men and women? A look at the New Woman who turns out to be the old Victorian ideal of woman as "redeemer" of man. Like Robert Elsmere this book has a strong villan, an older man attempting to destroy the faith/self of a younger/better man. Gaskell, Elizabeth: North and South. 1854. Kindle. Project Gutenberg. First published in serial form in Household Words 1854-1855 and in volume form in 1855. The story concerns a dissenting Anglican minister and his family (wife and daughter) who move from their parish in the South to the cotton textile manufacturing city in the North and interact with both the owner of a mill and the men and women who work in the mills. Well-crafted characters and social interaction, especially between classes, are Gaskell's strong points. A compelling read. Highly recommended. Corelli, Marie: The Mighty Atom. 1896. Kindle. Project Gutenberg. A quick read with an interesting view of childhood, faith, education. Depressing in the same way that Joyce Carol Oates, Emily Bronte, Sylvia Plath are often depressing to me. Corelli, Marie: A Romance of Two Worlds. 1886 Kindle. Project Gutenberg. The author's first novel deals with art and music and parallel universes. She attributes much (too much) to ELECTRICITY, particularly to "human electricity" This book reminds me of John Fowles The Magus and Emily Bronte Wuthering Heights and magical realism, best represented by Isabel Allende and Gabriel Garcia Marquez. I download books free of charge, directly to my Kindle (.mobi format for Kindle 1) from http://manybooks.net/ which offers thousands of books preformatted in many formats for computer, smartphone, electronic books, ipod etc. etc. Foster, Thomas C.: How to Read Novels Like a Professor. A jaunty exploration of the world's favorite litereary form. New York: Harper, 2008. I'm still nibbling this book. In addition to being helpful to students preparing to attend or taking college literature classes, I think it would be helpful to writers. When March comes in whether lion or lamb, I remember Mrs. Hewitt, my first & second grade teacher. Her birthday was March 8th and for decades I never failed to send her a card (at Christmas, too) until her sister wrote me a few years ago that she was no longer able to see the cards or know that she was remembered. Here is a photo of the class with Mrs. Hewitt. 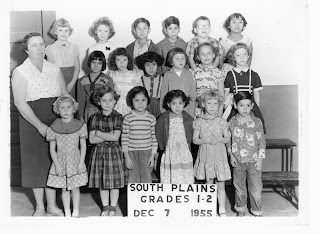 I am the second grader on the top row left wearing the corduroy dress with white PeterPan collar. and I'm standing in front of him. That memoir dealt with her classroom and a special needs student, Tommy. But there is a sense in which every student has special needs. I was in all her reading groups and when I read with the top group, "my" group, she never corrected my pronunciation. In the other groups we worked on my speech disorder--both a stutter and the inability to sound "s" when it came before a hard consonant. By the end of first grade, my speech was near normal. When we read aloud, she discouraged "calling words" and taught us "deportment" and "projection" and "inflection." Teaching two grades at the same time while attending to the needs of gifted and special needs and non-english speaking students required much creativity in creating a willingness in all her students. She bribed us. While Tommy had his time at the sandbox to keep him happy, other students had special work sheets and opportunities to color and do paper art. I did art only when it was required. My reward was my desk next to a bookshelf filled with books which I could explore when I finished my work. She often used older or gifted students to help with the younger or those with needs. While a second grader, I sacrificed "my reading time" to sit at a desk with a tiny first grader who spoke no English. I had a bowl of candies (little multi-colored gummy things the size of minature marshmallows) which I dispensed to the little girl as we completed each page in her primer. When she went to her reading group she could read aloud like everyone else. Throughout the day other students engaged her one-on-one with jacks or crayons or girls-only sandbox. By the end of the first six weeks, she had learned a lot of English and made a lot of friends. 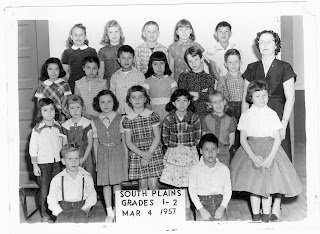 Long before there were "educators" and "mandates" and "in-service" ad inf. there were teachers. Mrs. Hewitt was one of the best and in her class room there was no child left behind. 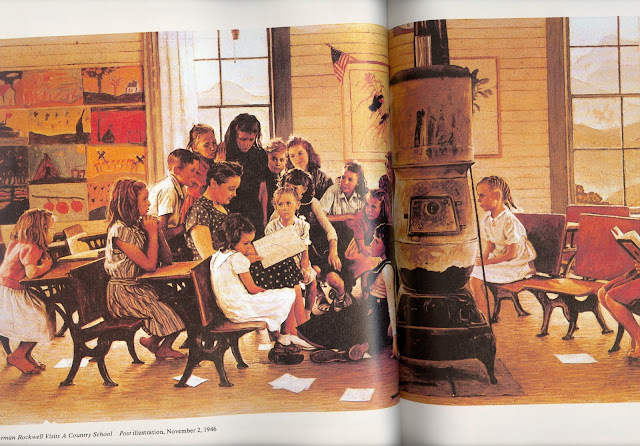 This Norman Rockwell illustration for the Saturday Evening Post (1946) evokes Mrs. Hewitt's classroom with some differences: our stove was black and in the corner, our windows looked out onto a playground and the flat Panhandle plains, and we all wore shoes.